San Antonio is a perfect place to enjoy a golfing vacation - good weather year round (ok, it's a little hot in the summer), plenty of options for lodging, tons of fun things to see and do, great restaurants, good shopping, and plenty of nightlife choices, and most important, excellent options for golfers of all skill levels at prices that will fit everyone's budget. 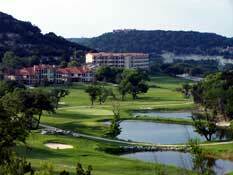 This page will give you some ideas and options for a fun golfing vacation to San Antonio. Back in 1886, soldiers who were supposed to be guarding the Apache warrior Geronimo were instead knocking golf balls around San Antonio's Fort Sam Houston. Thirty years later, A. W. Tillinghast built the first public golf course in Texas - Brackenridge Golf Course. Tillinghast would continue to design great courses including Bethpage Black, Baltusrol, and Winged Foot. Since then over over 40 courses have sprung up in San Antonio and many more course are located within an hour drive from downtown San Antonio. San Antonio Golf Courses will throw a little bit of everything at you that keeps us playing this expensive and frustrating sport. You'll find dramatic elevation changes, panoramic views, beautiful scenery, excellent conditions, water features, blind shots, forced carries, steep soft sand bunkers, and very unique holes. Texas Outside's twenty top rated courses include four San Antonio courses and San Antonio is home to what we think are some of the best par threes, the best front and back nines, and the prettiest holes in Texas. There are plenty of places to stay when you visit San Antonio and most will be within 20 minutes of several excellent choices to chase that little white ball. Downtown San Antonio has plenty of hotel choices with a wide range of price levels. If you do stay downtown and this is your first visit to San Antonio, then we would recommend you stay at the Hilton Riverwalk or the Marriott on the Riverwalk. Both are a little pricey, but they are located in the heart of downtown and on the Riverwalk which is a must for first time San Antonio visitors. From either of the hotels you can walk to the Riverwalk, good restaurants, some fun bars, and lots of attractions plus it's only 30 minutes or less to several excellent golf courses. Our favorite place to stay and play in San Antonio is the - great accommodations, good food at two restaurants, excellent service, and lots of amenities including tennis courts; a hiking trail; two pools with hot tubs, slides, and a kids pool; spa and exercise room, and plenty of planned activities to keep the kids busy. And they recently completed a $12 million dollar renovation. But best of all they are home to two of the best courses in Texas. If you're coming with a group of friends, relatives, or golfing buddies, consider splurging and staying in one of the La Cantera Resort & Spa Casitas or luxury suites that can sleep up to 6 or more. We've stayed in one of the suites which is over 1000 square feet with a large living room/parlor, comfortable sofa sleeper, large dining table for games, 42" flat screen for catching the scores, full size refrigerator, plus 5 small balconies providing an unbelievably beautiful panoramic view of the resort, pool, golf course, and surrounding Hill Country. Our suite had a large oversized master bedroom with a king size "heavenly" bed and large flat screen, a huge bathroom with a jacuzzi tub, a full bathroom in the living area, and a standard hotel room with two double beds adjoining the parlor/living area. The food at the La Cantera Resort & Spa is excellent - they have one of the best breakfast buffets we've ever had plus some interesting and very tasty breakfast items on the menu. Try the Eggs Benedict or the fantastic steak and eggs. For upscale gourmet dining, visit Francesca's at Sunset - what an experience, we had four wait staff serving us, an excellent appetizer, two very scrumptious entrees, and a dessert that was out of this world. Service and attention to detail are unequalled at the La Cantera - you will enjoy your stay with them. They have an attractive Stay & Play offering. 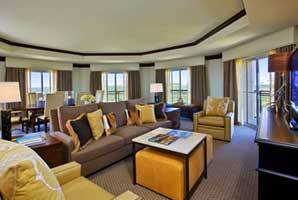 To learn more read our review of La Cantera Resort & Spa . But one of the primary reasons that we enjoy staying at La Cantera Resort & Spa is because they have two of the very best courses not just in San Antonio, but in all of Texas. So when you're planning your golfing vacation to San Antonio, La Cantera Resort & Spa's Resort Course and Palmer Course should be the first two tee time reservations that you make. 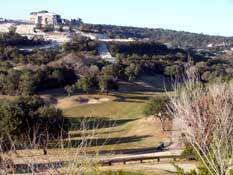 Olympia Hills Golf Course - located north east of San Antonio, Olympia Hills is a fantastic value and a fun and challenging course. The front nine is a roller coaster ride with elevation changes, rolling fairways, uphill greens, and tight fairways. The back nine is more forgiving but puts a premium on the approach shots and putting on some very challenging greens. 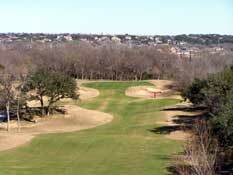 Texas Outside Rating 8.8 - Review of the Olympia Hills Golf Course. 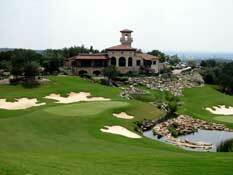 Tapatio Springs - rated 7.8 to 8.7 - this golf resort has 3 nines, each of which is a little different. Our favorite nine is the Ridge which plays up and down the hills and is very fun and challenging. 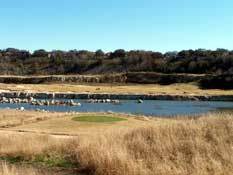 Hyatt Hill Country - rated 8.3 to 9 - the Hyatt also has 27 holes all of which are in very good condition and a real pleasure to play and the names (Oak, Creek, and Lakes) represent the character of each nine. Sitting on more than 200 acres, Hyatt Hill Country offers a wide range of terrain with rolling meadows, steep hillsides, wooded ravines, tree shaded plateaus, creeks, and ponds. Pecan Valley - rated 8.3 - recognized as on of golf's greatest masterpieces, Pecan Valley is a very traditional course that was home to a PGA Championship, meaning you can play holes that were played by some of the golf legends including The Golden Bear, Arnie, and Chi Chi. Silverhorn Golf Club of Texas - rated 8.0 - Silverhorn is always rated as one of the best of San Antonio and is considered as one of the most challenging layouts in San Antonio due to tree lined fairways, strategically placed bunkers, lots of water, and contoured greens. You might also consider playing the Alamo City Golf Trail with includes all six of the City of San Antonio's public courses - Cedar Creek, Brackenridge, Riverside, Willow Springs. 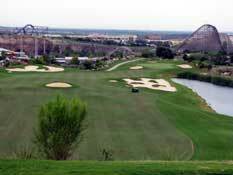 Olmos Basin, and Mission Del Lago - good courses and a good value. Use the Texas Outside San Antonio Golf Course Locator Map to find a course, link to the course review, and get additional information on the San Antonio courses. San Antonio is rich with lots of fun things to see and do. For the shoppers, you'll find plenty of options from Market Square downtown to the upscale Shops at La Cantera. Kids and adults alike will enjoy Fiesta Texas or Sea World. The Riverwalk, the Alamo, and some of the other downtown attractions are a must for first time visitors. To find some other fun things to see and do in San Antonio, check out the Texas Outside's Guide to San Antonio.